I woke up this morning not feeling the greatest. I actually went to bed earlier than the kids did last night! But I’m a trooper today. I got out of bed, went to church, came home helped kids finish homework and decided cleaning could wait, I’m going to bake again today! The Strawberry Mousse cups may not have turned out the way I wanted or the way they were supposed to, but they did taste really good. So in the midst of this terrible head cold, I am determined to bake these blueberry lime tarts. I’m thinking that I really should have doubled the recipe for these because the crust is so thin and it doesn’t seem like there is a lot of curd. However, I have plans…plans to bake some apples in cinnamon if I run out of the curd, or even use the left over mousse from yesterday! Blend flour, sugar, and salt in processor 5 seconds. Add butter and cut in, using on/off turns, until mixture resembles coarse meal. Add 2 tablespoons cream and egg yolk. Using on/off turns, blend until moist clumps form, adding more cream by teaspoonfuls if dough is dry. Shape dough into log. Cut crosswise into 8 (my tartlet tins are bigger because I only have 6 and the crust was fairly thin) equal rounds. Press each round over bottom and up sides of 3 3/4×3/4-inch tartlet pan with removable bottom. Pierce crusts with fork. Chill at least 1 hour and up to 1 day. Place 1/2 cup berries and sugar in heavy small saucepan. Using fork, mash berries coarsely. Cook mixture over medium heat until beginning to simmer, stirring often, about 5 minutes. Using rubber spatula, push as much of mixture as possible through strainer set over medium bowl. Mix remaining blueberries into strained berries. Set topping aside. Preheat oven to 375°F. Bake tartlet crusts until lightly golden, pressing any bubbles with back of fork, about 15 minutes. Cool crusts completely on rack. The hardest part for me in baking is the waiting. I’m am not the most patient person there is. So when it says to wait for 4 hours on the curd, I’m sitting here watching the time go by. I have a timer set for me to wait and pull it out. I”m super excited to taste these! Ok so a few hours later….these were so good. So good. The crust was so flaky and sweet. The lime curd was pretty darn good too. Not sure why mine looks darker in color than the original picture. But either way, I’m quite pleased with these. Super good. Not hard to make at all. I would use this recipe again for any type of crust. One of my new interests that I found on Facebook (imagine that) is Pinterest. A friend of mine had posted a craft project they found on there. I didn’t give it a thought until I saw one of my favorite bloggers, Brown Eyed Baker posting on this site as well. I did what I always do when I need to find something, I googled Pinterest. I got an invite and have been pinning since. There’s a bit of everything on this site. There’s arts and crafts, cooking, photography, technology, etc. You name it, it’s on there. And this is where I happened to find this dessert. I found this from Epicurean Mom’s website. I found yet another favorite food blog that I’ll be following. Amazing food and great pictures. I’ve been giving my all at making the desserts lately. I have been having a great time at baking them as well. I don’t get to enjoy them as much as the family does, but these are really good. These are really good! Did I already say that!!!!! Grease the bottom of a 9 by 9-inch baking pan with butter. Then place parchment paper over the top, pressing down at the corners. In a food processor, process the sugar, cinnamon and graham crackers until you have the consistency of breadcrumbs. Add the melted butter and pulse a couple of times to fully incorporate. Pour into the lined baking pan and firmly pat down with the bottom of a glass. Bake for about 12 minutes, or until set. Add cream cheese, eggs, lemon zest, lemon juice, and sugar to the food processor and pulse until well combined. It should have a smooth consistency. 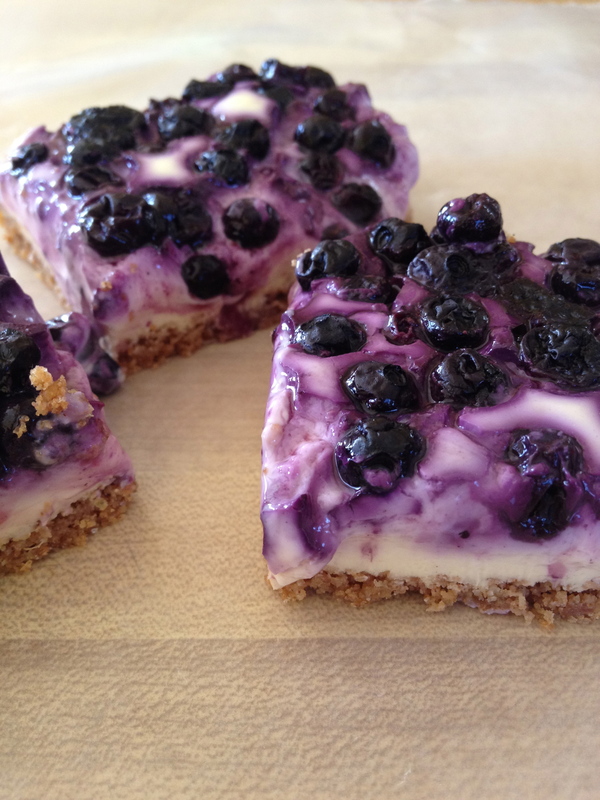 Pour onto the cooked graham cracker base and then sprinkle with blueberries. They will sink slightly but should be half exposed. Bake in the oven for 35-45 minutes, or until the center only slightly jiggles. Remove from the oven and cool completely before Refrigerating for at least 3 hours. Once set, remove from pan using the parchment lining and slice into 10 rectangular bars. These are a must make recipe!